This post is a follow-on from two preceding posts on a #CaseStudy of someone with active PPMS. You may want to read the prior posts and the relevant comments before proceeding with this post. I note that many of you were horrified that I would ask the community how to manage a patient of mine with active PPMS. I defined him as having active MS because his spinal fluid neurofilament levels are raised; in other words he has active neuroaxonal degeneration going on over and above what you would expect for his age. I note that some of you have asked about the sensitivty of MRI picking-up new lesions. You are correct in stating the MRI is not very sensitive and only detects lesions that are ~4mm in size or larger. We know this level of sensitivity is very poor as the majority of active lesions pathologically are microscopic and MRI also misses almost all of the gray matter lesions because of lack of contrast with the background. Therefore, his MRI that did not detect any new, or enlarging, T2 lesions or Gd-enhancing lesions, does not tell me that this patients disease in inactive. If you ask him he knows his disease is active; he is getting worse despite a ‘stable MRI’. In the past I would have motivated to treat this patient with off-label rituximab going the IFR (individual funding request) route. The latter has been stopped by NHS England. Similarly, other high-cost DMTs are out of the questions; our NHS Trust would not be prepared to pay for them and NHS England would say no, as none of our current guidelines allow using these agents in PPMS. Making him wait for ocrelizumab is difficult as we can’t be sure it will get a license from the EMA for PPMS and then there is the issue of NICE; i.e. greenlighting it for use in the NHS. Waiting for Ocrelizumab could be a long and potentially a futile wait. Similarly, adding him to a waiting list for an upcoming trial is also problematic as there are no immediate trials on the horizon and there is also no gaurantee that he would be eligible for such a trial. This particular patient may not be prepared to be randomised to a placebo. I have not posed that question to him. Watchful waiting is an option. I note very few of you have opted for this option and I know that for this patient this position is a no-no. The reason he came for a second opinion is that he is not prepared to do nothing. He would rather go onto something than nothing. I have therefore offered him the option of either low-dose oral methotrexate or off-label subcutaneous cladribine. He will come back to me in the new year with a decision about which option he wants. I have explained to him that it us unlikely that either these agents will have a major impact on his lower limb function over the next 2-3 years. He needs to be prepared for his walking to continue to deteriorate. However, if we can suppress ongoing inflammation we may slow down progression after that. It is helpful that this particular patient understands therapeutic lag. The real reason he wants a treatment, however, is to try and preserve upper limb function. This patient is also prepared to undergo annual lumbar punctures so that we can montitor his spinal fluid neurofilament levels. We would expect to reduce these levels overtime. I am sure the critics out there will say you have no evidence that cladribine works in PPMS. I would say yes, and no. We do have a study of cladribine in SPMS and PPMS that was too short, based on the study population, to show an affect on EDSS progression, but cladribine clearly had an impact on MRI activity. I am also of the opinion based on recent insights that all anti-inflammatories work in more advanced MS, however, we needed to look in the right window to see a treatment effect. 1. Managing expectations about the treatment effect; i.e. there will be no dramatic effect. 2. Informed consent; this patient knows the risks of the treatment. 3. The therapeutic principles of offering an off-label treatment, including the concept of therapeutic lag. 4. Monitoring and treating-to-target; we are basing our treatment on the principle that we are want to reduce spinal fluid neurofilament levels and to suppress the development of new and/or enlarging T2 lesions on MRI. Please note that in an ideal world this patient would have received his first course of orcelizumab a month ago. However, we don’t live in an ideal world, but a world of compromises. The decision to offer him low-dose methotrexate or off-label cladribine is a compromise. I don’t think off-label drugs are a panacea for treating people with more advanced MS, in this case PPMS, but they offer some hope, albeit limited, over the certainty of getting worse whilst waiting for potential orcrelizumab treatment in several years time. Rice et al. Cladribine and progressive MS: clinical and MRI outcomes of a multicenter controlled trial. CladribineMRI Study Group. Neurology. 2000 Mar 14;54(5):1145-55. 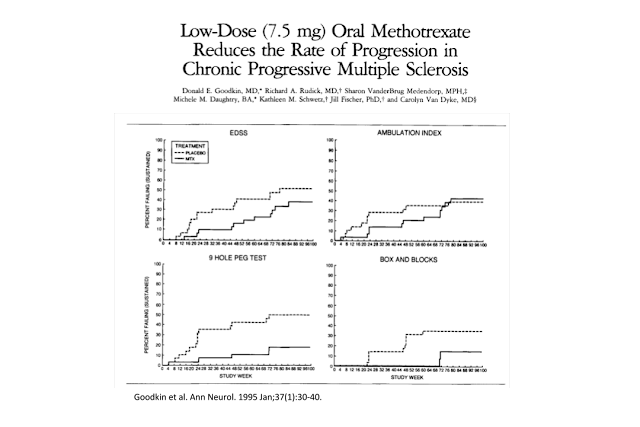 OBJECTIVE: To evaluate the safety and efficacy of two doses of cladribine in patients with progressive MS.
BACKGROUND: Treatment of progressive MS patients with cladribine in a previous single-center, placebo-controlled clinical trial was associated with disease stabilization. METHODS: In the current study, 159 patients with a median baseline Kurtzke’s Expanded Disability Status Scale (EDSS) score of 6.0 were randomly assigned to receive placebo or cladribine 0.07 mg/kg/day for 5 consecutive days every 4 weeks for either two or six cycles (total dose, 0.7 mg/kg or 2.1 mg/kg, respectively), followed by placebo, for a total of eight cycles. Thirty percent had primary progressive MS (PPMS) and 70% had secondary progressive MS (SPMS). EDSS and Scripps Neurologic Rating Scale (SNRS) scores were assessed bi-monthly and MRI was performed every 6 months. The primary outcome measure was disability (mean change in EDSS). RESULTS: Mean changes in disability did not differ among the groups at the end of the 12-month double-blind phase. Both cladribinet reatments were superior to placebo for the proportion of patients having gadolinium-enhanced T1 lesions and for the mean volume and number of such lesions (p < or = 0.003). Differences were statistically significant at the 6-month evaluation time, with < or =90% reduction in volume and number of enhanced T1 lesions, which was maintained through final evaluation. This effect segregated largely with the SPMS group. The T2 burden of disease showed a modest improvement in cladribine-treated patients and worsened in placebo-treated patients. Most adverse events were mild or moderate in severity and not treatment limiting. CONCLUSION: No significant treatment effects were found for cladribine in terms of changes in EDSS or SNRS scores. Both doses of cladribine produced and sustained significant reductions in the presence, number, and volume of gadolinium-enhanced T1 brain lesions on MRI, and cladribine 2.1 mg/kg reduced the accumulation of T2 lesion load. Cladribine at doses up to 2.1 mg/kg was generally safe and well tolerated. Filippi et al. The effect of cladribine on T(1) ‘black hole’ changes in progressive MS. J Neurol Sci. 2000 May 1;176(1):42-4. We compared the changes of the volumes of T(1)-hypointense lesions seen on the magnetic resonance imaging scans of the brain from 159 progressive multiple sclerosis (MS) patients who were enrolled in a double-blind, placebo-controlled trial assessing the efficacy of two doses of cladribine. Although in patients treated with cladribine there was a tendency to have a lower increase of T(1)-hypointense lesion volumes than those treated with placebo, no statistically significant effect of cladribine on T(1)-hypointense lesion accumulation was found over the one-year double-blind phase. Furthermore, no significant treatment effect was also detected in a subset of 22 patients who received placebo during the double-blind phase of the study and cladribine during the subsequent one-year open-label phase. We conclude that cladribine does not have a major impact on the mechanisms leading to severe tissue destruction in progressive MS.
Prof G, you're not right in the head. You say: " I don't think off-label drugs are a panacea for treating people with more advanced MS, in this case PPMS, but they offer some hope, albeit limited, over the certainty of getting worse whilst waiting for potential orcrelizumab treatment in several years time." This patient may get cancer from the orcrelizumab you prescribe just for "albeit limited" results. That is shameful. You're out of your depths. It has not been established that ocrelizumab causes cancer. The increased numbers in the trial could be a chance finding. Anyway treatment decisions are not a one way street. The person concerned would have to sign up to possibility of there being an increased risk of cancer. Are you a watchful waiter? There is no problem with that either. It is all about personalised medicine. Doesn't life cause cancer? I thought age was a major risk factor for cancer. Yes. Age is a major risk factor. At present the life time prevalence of cancer is about 1 in 3. "At present the life time prevalence of cancer is about 1 in 3." So it is not as if we would wish to increase this risk, and Ocrelizumab may do that. How does "may get cancer" stack against "will be crippled" in the forthcoming decade? If you are already convinced that ocrelizumab increases your chances of cancer and you don't want to take the risks then you don't have to. That is all Prof G is saying it is a potential treatment option. I would surprised if there are no risks associated with methotrexate nor cladribine. If you are already convinced that ocrelizumab increases your chances of cancer and you don't want to take the risks then you don't have to. I know that!! But I am concerned that the launch of this dubious drug Ocrelizumab will take impetus away from further research into PPMS. Into finding the cause of progression, finding a better solution that is not a risky wrecking ball. Ah, this gentleman again (who may or may not be real?!) I feel I'm getting to know him well and am sure he will opt for DMT of some sort in January. Assuming he does, would he potentially qualify for PROXIMUS trial after six months? Or would that muddy the waters if you are using nfl to assess whether LDM or clad having an effect? Surely he would wish to also benefit from neuroprotection from oxcarb and as he doesn't have brain time left to waste on trial why not just let him start taking it? I guess that's difficult to justify but if he were to ask? Thanks for posting this. I'm in a very similar situation as your patient, and will face the same questions in a couple of weeks on my next appointment. I feel a bit more prepared. All the best. Please remember there are no right or wrong answers. People with PPMS are in limbo waiting for ocrelizumab. The real question is what do we do if the EMA and/or NICE say on to ocrelizumab? We need a plan B.
I have PPMS and I'm not waiting for Ocrelizumab, for the same reasons as have already been written in comments several times on this blog. This is a potentially very risky drug. There is another form of it already available which may be safer. And I feel very concerned that people with PPMS will be expected to just take it, be satisfied, shut up and go away. I ask of anyone promoting this drug – whose pockets are your hands in? This is hilarious. Please show some form of evidence confirming that mabthera for some reason does not increase cancer rates or be quiet. Please note that ocrelizumab is not licensed yet and hence is not available for commercial use; therefore it can't be promoted. Interestingly, the same company that will produce and promote ocrelizumab commercially is the same company that makes rituximab. It can be promoted in that it can be advocated that people with PPMS take it if/when it becomes available. Interesting – only in the sense that relaunching Rituximab in the new form of Ocrelizumab means an opportunity to make more money on it. Thanks for your responses. My neuro is a careful, temperate man, and will not give frivolous advice. best regards all. Hilarious? That is a very strange and inappropriate remark. I would use Metrotexate and/or Cladribine in the hope of saving what still had function, while Ocrelizumab isn't released. As I said I know many patients with NMO, which compromises all spinal cord and vision, which are in Metrotexate and they are well as far as possible. Is there any ongoing study of Alemtuzumabe for PPMS and SPMS? I know a very young person with SPMS who will use Alemtuzumabe. Prof G are then any factors that may differentiate methotrexate from cladribine? How would you counsel someone on these two options? I'm not a million miles from your patient, lets call him Pete. unlike Pete I have SPMS, I can only walk a short distance using a rollator and have serious foot-drop. I have seen myself getting clumsier over the last year or so. I find writing difficult and doing up buttons tortuous. The other big difference to Pete is that I am in the MS SMART trial. It finishes for me in 13 months. While the MS has affected my physically abilities my mental agility does not seem to have deteriorated. Am I on a placebo or is there a useful drug at work protecting my brain? The elephant in my room is what do I do when MS-SMART finishes. There will be no publication of the results until late 2018. I want to keep what ever functionality I still have for as long as possible. I'm sure there are lots of us out there in this sort of position. Everything is so near and yet so far. What can be done?